Separate the egg noodles so they’re loose. Bring a large pot of water to the boil. Add the noodles and cook for 20 seconds. Transfer the noodles to a large bowl of iced water. Allow the noodle to cool. Then drain them well and spread them out on a large tray. Place them uncovered in the fridge for 30 minutes to dry out. In the meantime, place the chicken in a bowl and add all the marinade ingredients. Mix well. Set aside until ready to stir-fry. To make the stir-fry sauce, mix the ingredients in a small bowl. Set aside until ready to stir-fry. When the noodles have dried in the fridge, divide them up into 4 even bundles. Heat a tablespoon of oil in a wok or large non-stick frying pan. Add one bundle of noodles and spread them out in the pan. Allow them to cook for 30 seconds or until starting to colour and then flip them over. 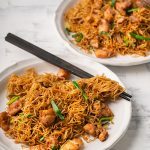 Continue flip and stir-frying the noodles for 2-3 minutes or until they’re deep brown colour. Transfer the noodles to plate. Repeat with the remaining noodles. For the final stir-frying step, heat another tablespoon of oil in a clean wok or large non-stick frying pan. Add the white part of the spring onions and the ginger and stir-fry for 20 seconds. Add the chicken and stir-fry for 2-3 minutes or until the chicken is almost cooked. Add the carrot and the cabbage and stir-fry for another 2 minutes or until the chicken is cooked and the vegetables have softened. Add the noodles and the stir-fry sauce. 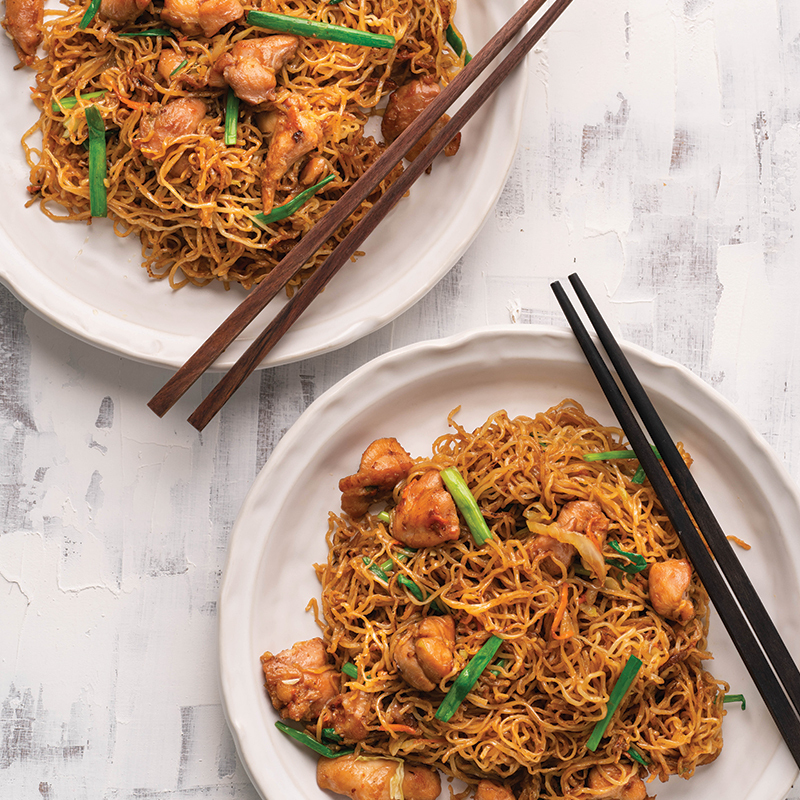 Use tongs and a spatula to mix and stir-fry the noodles until everything is well combined. Add the green part of the spring onion. Remove the pan from the heat and drizzle over the sesame oil. Toss until well combined and serve with chilli oil, chilli powder or sambal oelek if using. 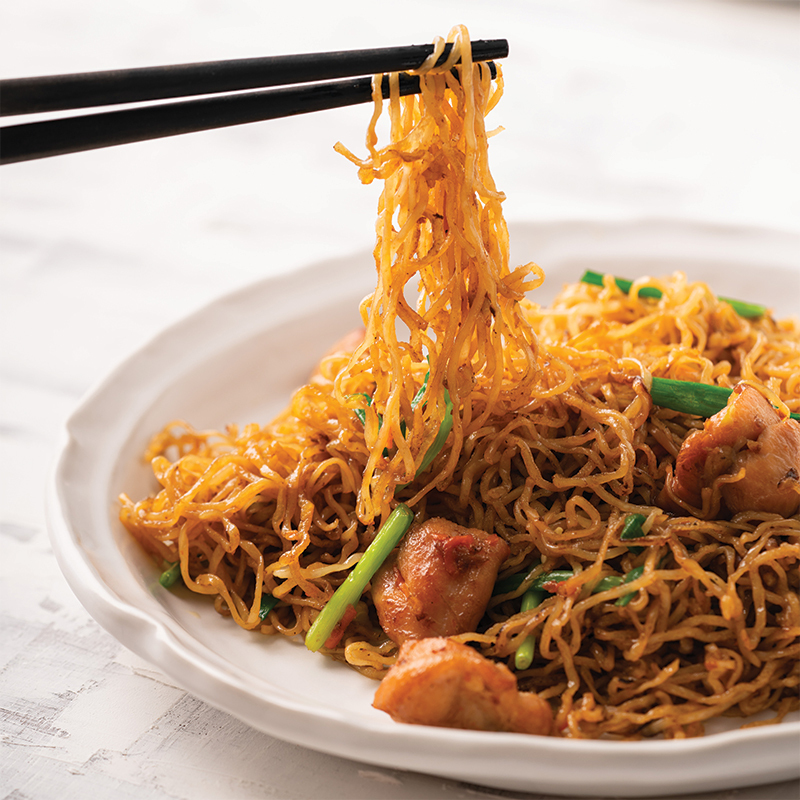 You can find fresh Chinese egg noodles at an Asian supermarket. They’re also called ‘wonton noodles’. Chinese Shaoxing Wine is a type of Chinese cooking wine made from rice. You can find it in the Asian aisle of some major supermarkets or from an Asian supermarket.